To give me extra motivation to rid my house of clutter regularly, I’ve decided to start a new blog feature, “Clutter Comedy,” in which I describe my most memorable weekly clutter discovery every Sunday (which I envision as a day of rest after a productive week of de-cluttering). Other bloggers who wish to join in are welcome—just post a link in the comments! There’s no need to publish any “before” photos of your clutter, if they are too embarrassing. The idea is simply to get motivated to clean it up, while having a bit of fun too! This is my husband’s bookcase in our study. On Friday, I dusted it and removed papers and other clutter that had been sitting on top. 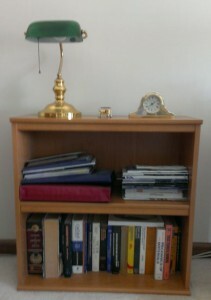 I also wiped the cobwebs off his ancient engineering textbooks on the bottom shelf. On the second shelf, there are two stacks of accumulated stuff: old photos on the left, and catalogs and magazines on the right. We thought we’d been doing a good job of keeping the catalog and magazine stack up to date because we kept only the most recent ones. But although we dutifully disposed of old catalogs and magazines when new ones arrived to replace them, we neglected to go through the whole stack and look at what was under them. The result—Clutter Comedy! My husband took the stack off the shelf on Friday and noticed that we had several outdated maps at the bottom. To call them outdated is an understatement. Evidently we had brought them with us from our previous house when we moved 12 years ago, put them neatly on the shelf, and never looked at them again. We haven’t carried print maps in our cars for many years, now that it is so much easier to get directions from OnStar or, if that service is temporarily down, from the GPS navigation app on our mobile phones. So the maps would have been useless even if they had been more recent. But the funniest thing was that the maps were so out of date, the street where we now live wasn’t even shown because that part of the subdivision had not yet been built! We both got a good laugh out of that. smiling at your clutter comedy. And thinking about our next project–the attic. Heaven knows whats up there, but it’s not pretty. I was just thinking how you could make wrapping paper or even notecards out of old maps. Not that I’ve tried. Thanks for visiting my blog, too, Meg. Good luck with the attic, Kathy! I’ve never made anything out of old maps either, but the ones we got rid of weren’t interesting enough to be useful for crafts; they were just plain black-and-white street maps.